Nothing will ever be the same, The Cyborgs are coming! The second production by INRI, the brand new independet record label based in Turin, Italy, is a two man band that comes from the future and plays a primordial blues/funk, bonded to the roots but so groundbreaking that human beings will understand it just in twenty years! In a time where image reigns, two perfect strangers decided to remain anonymous wearing a welder’s mask. They have no identity. Like the most brilliant software, they consist of a 0 and a 1. 0 plays the guitars and sings through a microphone in his mask. 1 plays synth sounds with his left hand and drums with the remaining limbs of his body. Together they produce some thrusting and pumping blues. They preach a return to the simplicity of the past instead of the destructive future we are heading towards. Their music is the same: simple but effective. You can make it with just two men, although you have to posses the talent of these Cyborgs. It is impossible to resist this electrofunkblues, resistance is futile. They come from the future and nobody has ever seen their faces. 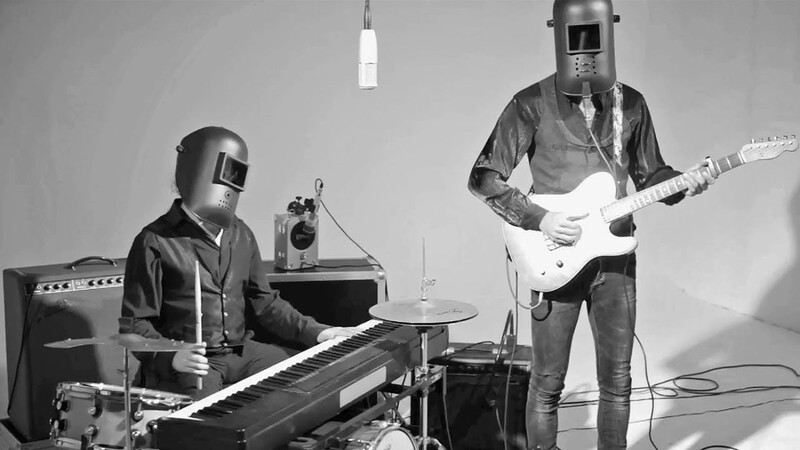 THE CYBORGS are a power duo that surprises and represents a real “case” in the whole italian music scene. It would be hard to find a band with the same skills, passion, fun, energy, irony. THE CYBORGS are instinctive, visceral, excessive, restless, deep, in one word explosive. Their first official album “The Cyborgs” contains 12 original songs: blues from the roots with a modern funk attitude. It’s useless to try and further describe them: you just have to listen to their music and dance to the rhythm of the Cyborgs boogie!